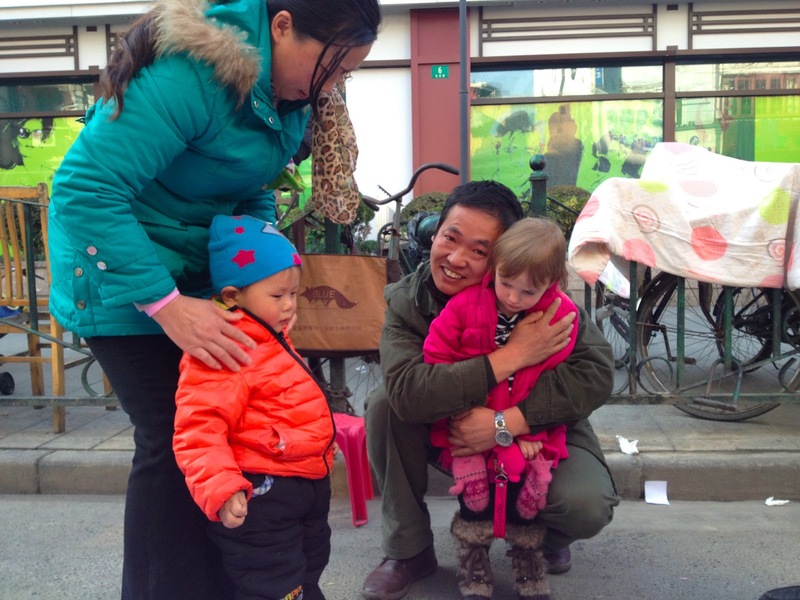 January 7, 2013: The Chinese people have been so friendly. 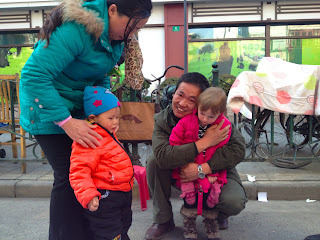 They are warm, welcoming, and delighted to try to speak English with us. And they LOVE Zoe. They seem to love children in general, and Zoe is so petite and cute and blond that she stands out. On the street, just walking, people come up to us, pick her up, kiss her, ask to take pictures with her, and give her candy and gifts. It’s amazing to watch - and it terrifies her. Think of it - already the cities are crowded, and there is traffic everywhere, and she’s holding my hand tight and being taken somewhere she’s never been before. All of a sudden, two or three or a crowd of people she’s never met surround her. They look different and they come in close and fast. They speak to her in heavily accented English or jabber to each other in Chinese, and pick her up and try to get her talking to them. They want her to smile for pictures. It’s culturally surprising - although we talk to plenty of strangers at home no one in the US would consider touching or grabbing a child they didn’t know, and most often questions are directed at the parents. 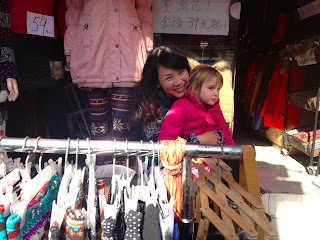 In China people walk right up to her and ask her name and her age, and expect responses which she is just too shy or startled to give. It’s been stressful - not AT ALL because I am afraid for her safety, as she is clearly not in danger from these lovely folks. Mostly, I am embarrassed that she is not performing well. In these situations she ducks her head and refuses to engage. She won’t look at their cameras. She turns away and acts aloof. It is perfectly clear to me why she is behaving this way, but I can’t believe that she is not more culturally sensitive. Does she not want the Chinese people to adore her? Does she not wish to participate in conversations with strangers that we will never meet again? What is wrong with my parenting that she cannot at the drop of a hat change all of her normal behaviors to be delightful with the Chinese? Why must she be so THREE? This aside, I am so proud of my girl. We knew that she was a cheerful, adaptable baby and a good sport in general, but I had no idea when we made our plan how rigorous this tour was going to be. We spent hours every day on buses, ferries, trains, and planes, and had a concert every night during which Zoe had to entertain herself and be watched by my colleagues while I performed. And the first day or two were rough. I couldn’t keep her on any sort of schedule because everything was different all the time. We quickly abandoned any pretense of being potty trained - when we had no control over the rest stops it was hard enough for me to stay comfortable - forcing myself to pee at any opportunity, even in the least pleasant squat toilets, because we NEVER knew when the next chance would come. Zoe wore diapers the whole time and I sometimes wished I could, too. I had packed snacks, but never could seem to find the balance between keeping her comfortable and having her hungry at mealtimes, mainly because I could never predict mealtimes. So eating was always dodgy. But Zoe is a trouper. She made great friends with the students and chaperones right away. She fit right in with the orchestra and everyone knew and loved her by day two. They would play games with her, admire her toys, talk about who knows what - and help to look after her as we traveled. Within a few days she had it down. I could ask her to carry bags, or tell her to stay close, or send her with someone from the group as I hauled a suitcase up stairs, and she could hop to it. She was not always a hindrance and I didn’t have to drag her as I had feared I would. On the Great Wall, she put her mountain climbing legs back on, and we hiked faster and farther than many of our colleagues. Up and down ancient stone stairs whose risers hit her at mid-thigh - she never complained and I have rarely been happier with her. It felt wonderful to be out in crisp, cold, LESS-polluted air and actually using our bodies, and the Great Wall experience far exceeded my expectations - beautiful, ancient, walkable, and full of friendly, wonderful people. Even as I write this, on the airplane heading home, she’s being fabulous. She was just up visiting with all the folks from the tour - she’d find one of her special friends and then enlist his help in finding another, and I have realized that she knows more students by name than I do. Currently she’s watching a movie on the computer and keeping an eye on the seatbelt sign for us. I had dreaded the long flights but this has been easy and fun. We had thought long and hard about bringing Zoe on tour, and with a different child it might have gone very differently - but at this point we have no regrets. 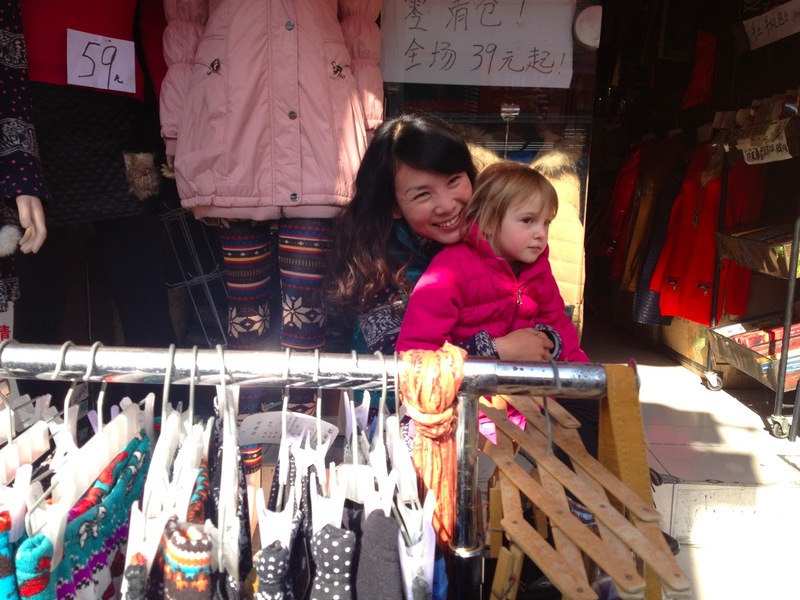 Despite the difficulties, touring China with my daughter is going to remain one of my life’s highlights.